So who will quarterback the Buccaneers on Sunday in Chicago? Dirk Koetter was asked whether he has made that decision moments ago during his postgame news conference at the Stadium on Dale Mabry Highway. Koetter dodged it but it appears he’s already decided it’s Ryan Fitzpatrick. “Let’s see when the injury report comes back,” Koetter said, noting that players sometimes come back with injuries the next day. “I mean, I’d love to get a chance to talk to Jameis face to face before I tell the rest of the world,” Koetter continued. That sure sounds like Fitzpatrick won’t be replaced when America’s Quarterback, Jameis Winston, arrives at One Buc Palace this morning. 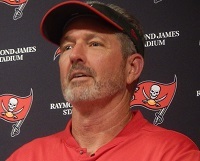 Koetter added that he was sure Jameis would embrace his role whatever it may be. Might as well fire Dirk if they go 2-2 with Fitz. Can we replace the defense????? The Bucs are the worst NFL franchise so that would be the type of decision the Bucs make. It worked when they ran Doug Williams and Steve Young out of town so let’s try that again. Architek Says: Can we replace the defense????? I have a better one for you. Can we replace Mike Smith???????? PLEASE!!!!!!!! If Fitz starts Dirk is signing his own pink slip. The game is not hard for QBs at this level when they have all day and everyone is wide open. But what do you do when there is pressure and there is tight coverage. Fitz tonight fell apart with 3 picks in a row that basically ended the game. If Jameis did that people would be trying to run him out of town tonight. Jameis starts or this season is over, Dirk is done and this whole thing gets blown up at the end of the year. In my opinion, it’s still Fitz job to lose. He made awful mistakes in the first half. However in spite of his mistakes he put the team in a position to win with 3 minutes left and had an excellent 2nd half, then he flopped and went 3 and out. This loss is nowhere near all on Fitz, but him being rattled particularly in the 2nd quarter were huge contributing factors to this L. But the dimes he threw to Godwin that were fumbled/dropped didn’t help, as well as not having ANY run game whatsoever. If Fitz has a bad opening against the Bears, look for a Jameis insertion in the second half. But as far as who will start against the Bears? Probably the man with over 12000 yards and 11 TD’s in 3 weeks vs guy coming off suspension. fitz is the guy come guys you think the bucs can we every game? i have been a true bucs fan since 1979. so what they lost tonight they will have games like this. Mike Smith needs to get his head on stright and do someting with our D.
Doesn’t matter, Dirk will still punt on 4th down, take the ball out of his hot handed QB and place the outcome squarely on a lousy D and Smitty’s expert coordination and near impossible to decipher coverage and blitz packages. Fitz needs to start. But this defense is less than the sum of its parts. Full time Wildcat offense with Fitz and Jameis back there. Either of this two QBs could easily be the team’s leading rusher. How can you have such a corps of receiving weapons and ZERO f**king running game? Fitz played great in the first two games and awful in game three but the coach would be making a terrible mistake not starting Jamies immediately. I say make everyone think it will be Fitz, the switch it up last moment. Assuming Fitz can even play. He had a knee injury earlier in the week and I can’t see all those hits he took helping it heal. You idiots do understand that Pitt players get paid to play too? That’s a pretty damn good offense out there being led by a veteran all pro QB. The Bucs D shut them out in the 2nd half and the offense turned the ball over 4 times in the first half including a pick 6. I’ll say it again. If you take a step back and really look at it, they are getting better. Their playing with almost all rookies in the secondary and how many times did i your hear Brown’s name in the 2 pond half. Unbelievable. Some of you people need to get a grip. The team is 2-1 with a lot of potential going forward. NDog, Fitz just had a Jameis type of night. “If Jameis did that”, sh!t, He does that every other game. This was a prototypical Jameis type of game. Commit 3 turnovers in 1st half, bring the team almost back and lose by 3. Penalties killed us tonight, just like last few seasons. Fitz starts in Chicago against a really good swarming Bears defense, then Jameis is after the bye, that’s the most likely course here. However we shall see, I’m more than fine riding Fitz if he can go against the defense and look good – but if we get the Fitz we saw tonight, then he’s going to throw 7 INTs and make it an easy choice. The Bucs had the ball with 3 minutes to go and a chance to win. Fitz had time to throw and threw it to the Steelers on 3 straight plays. All should’ve been picked. First time he had real pressure this season and that was the result. You cant start 3 rookies in the backfield against Ben. ok guys help me with this. why is the D coners and safty’s playing so damm soft.? and why is Mike Smith calling for all them damm biltz when they don’t work. Matt from BC – But the coaches handbook says to punt the ball, and so long as you do what the coaches handbook says to do the media won’t question you and people will defend you no matter what, because that’s what the coaches handbook demands you do, and only people that know nothing about football would go against the coaches handbook. Oh and nevermind the Eagles literally winning a SB because they ignored the coaches handbook, you are not allowed to say the game has changed, nope, you run it up the middle on first down and you punt from opponents 36 and you punt with the game on the line when you need 10 yards and have thrown for over 400 already. I’m a Jameis backer but he hasn’t been with the team, hasn’t practiced, hasn’t done anything in 3 weeks, and now on a short week you take him on the road to go against one of the best D’s in football? No, you let Fitz play that game and see what he can do. You don’t want to rush Winston right back into the start against that defense, on the road, in a place the Bucs never win, it’s just setting him up to fail. Instead Fitz plays and you see how it goes, that makes the most sense. I think we all are happy fitz played great the first two games but he was awful tonight and should not start any more games unles Jamies gets hurt. Agreed. Sending Jameis into action against the Bears is the same as throwing him to the wolves. Who knows, he could throw 3 ints the first half and have people calling for Ryan Smith. The only thing I want to add is I’m 100% behind Coach Koetters decision on either way he chooses but ..something I did sort of picked up on is that Fitz’s legs looked a little heavy with fatigue tonight throwing flat footed. That Chicago pass rush is supposed to be brutal and we got a taste from Pitt tonight. Winston’s legs are going to be fresh. Just please tuck it under duress, no strip sack fumbles. Something I would monitor through the week and have Jameis ready. Of course they will start Fitz. We all said if 2-1 or better, Fitz should get the start and let Jameis come back after the bye, having 2 weeks to get back in sync with everyone. And if Fitz lights it up in Chicago, then ride the hot hand and let him keep going until he comes back to earth. If Fitz had the receiving corps the Bucs had two years ago I think he would’ve thrown 7 or 8 picks tonight. unbelievable – Agree completely. Even if the Bucs are 2-2 that’s better than anyone, who is responsible, would have thought going into the bye. You ride Fitz until his beard falls off, then you dump him to the side of the road like a [email protected]#@# after you #@#@#@# in #[email protected]#[email protected]# and @[email protected]#@. @#@#@! JAMEIS WINSTON!!! Clap Clap Clap Clap CLAP!!! JAMEIS WINSTON!!! Clap Clap Clap Clap CLAP!!! I am riding with the Franchise!! Any who thinks Fitz should start needs to get their eye checked. And for those who think Winston won’t be ready, think again he has had three weeks to watch the Bear’s, and plenty of time to see what they been doing on defence.Two thing I know for sure, Winston will be 100% ready both mentally and physically for the Bears and Fitz might be 100% mentally ready but not physically. Hay Nick is a Superbowl winning,MVP QB. Did he start this week. Here’s a thought, Jamis or MVP Nick pick one. Winston every day and twice on Sunday. Jaguar’s coach did the same thing. Down three you gotta go for it. Run a simulation, it’s not even close. You gotta go for it. If you make the first down you are odds on to win or tie. Miss and you’re in the same situation as if you punted except you can’t tie with a field goal, but if you get a three and out, you have a chance to score a TD and win. Three and out, you get the ball back with two minutes left. Either way if they get a first down, game over. Down 1, 2 or 6-8, it’s not as clear. Punting slightly better in the latter case, going for it slightly better in the former. Punting is way better if you’re down 4. It’s way way better down 3. With payrolls at close to $200m, why can’t teams spend a few thousand for someone that can do basic 2+2 math instead of making huge mistakes like this? Neither Fitz nor Jameis can catch, block, run, cover WRs, or de-cleat the RB…until that happens it doesn’t matter diddly who the QB is. This was a sloppy game all around. Fitz had one bad interception, the other 2 are a wash, Godwin dropped balls uncharacteristically and fumbled. Why aren’t people (actually there were a ton on the game day thread – foolishly) screaming that Godwin should be benched. SMH, stupid fans who have never played competitive sports (very well at the least). The Bucs, even as horrible as things looked, were one Godwin dropped TD or one DJax Punt return TD away from a comeback victory. Why does everyone have high expectations all of a sudden when nobody, including fans, thought we would be 2-1 right now. This was a wake up call for the offense. The defense needs a prayer. The DL played well enough, but the secondary literally shat themselves looking at the Steeler offense. This was going to be a high scoring game, nobody with a clue thought anything less. We had one too many costly mental breakdowns. This offense without a running game and a porous defense can win day in and day out against anybody. That’s the one take away from MNF. The offense battled back. From 30-13, it became 30-27. I don’t know what happened on that last offensive 3 and out but it definitely wasn’t one man’s fault. On the bright side, it pleased me immensely to see another team with a kicker problem. LMAO. Matt from BC – Thank you, I’m easily the smartest and most knowledgeable guy here, which upsets many people, but to those that know football and don’t just repeat what they read on bumper stickers, they tend to appreciate my takes. I also throw in comedy because, well, I’m also the funniest person here, and that makes the dullards who read bumper stickers doubly mad. Anywho I’m totally for debate, I don’t care if someone disagrees with me, and some people can disagree and still make a point I disagree with. But punting there, punting in the 1st half when you have the ball at the Pitt 36, it’s just cowardly coaching, it’s what losers do who care more about not rocking the boat than they care about winning. But, damn it was like watching twins punting the ball. That Berry guy was lights out good like Anger. Horrible field position was a drive staller. I had a feeling special teams would be a big part of the game. Fix the bad drafting and bad coaching. Make Lee or Ira of JoeBucsFan the head coach. Rod Munch is a Jameis hater. Don’t let him make you believe anything but…. One decision that might have changed the game was going for the TD at the end of first half instead of field goal. Even if you don’t make it Steelers have less time and have 90 + yards in under a minute. We had two games of almost error free football INT’s,fumbles and drops caught up to us. I agree that Koetter should be fired if Jameis doesn’t start next week. I promise you Jameis is already at One Buc getting himself ready for this week. Through three games this year, Fitzpatrick has played better than Winston has ever played in any three-game stretch of his NFL career. “America’s Quarterback” about to be benched. Boy did you guys go all-in on the wrong horse.